Light is essential to all living things, especially plants. There is a myriad of options for lighting your aquarium and proper lighting is an important factor in successfully maintaining a planted aquarium. Using the right color of light will create lush and healthy plants, and keep algae to a minimum. Your plants need a substantial amount of light to grow and this may require more lighting than what came with your fish tank. Choosing the fixture that fits your ideal fish tank will prevent you from re-buying. Giving your plants light they can use is very important. Plants use very little yellow, orange, violet, and almost no green light. These colors are present in bulbs so that you can see them reflected off your plants, animals, and décor. They are important for creating a vibrant, beautiful aquarium; but not for actual plant growth. Soft white is sometimes used to create more viewing light. It's not very effective for growing plants. There is very little red light, and only a little Actinic Blue. It does not promote algae growth and will only help plants a little, if a lot is used. Day light bulbs produce a light spectrum similar to that of the sun. The ultra violet and infrared spectrum are reduced, but the visible spectrum is maintained. There is a lot of Actinic Blue, and red. These will make plants grow. Algae is also a plant. Plants use a specific kind of blue light called, Actinic Blue, for vegetative growth. Vegetative growth is the growth of the plant leaves, and stems. Growing plants entirely under Actinic Blue light will make them grow very bushy, and leafy. Soft white bulbs are designed to emit very little of this light to increase efficiency. Actinic Blue light is not very visible. Our eyes do not see this color very well. By reducing Actinic Blue, soft white bulbs are able to create more visible light with less energy. Red light is also used by plants. Red light is necessary for producing flowers. Red light will also stimulates plants to grow taller. Plants grown under a lot of red light are tall and stringy. 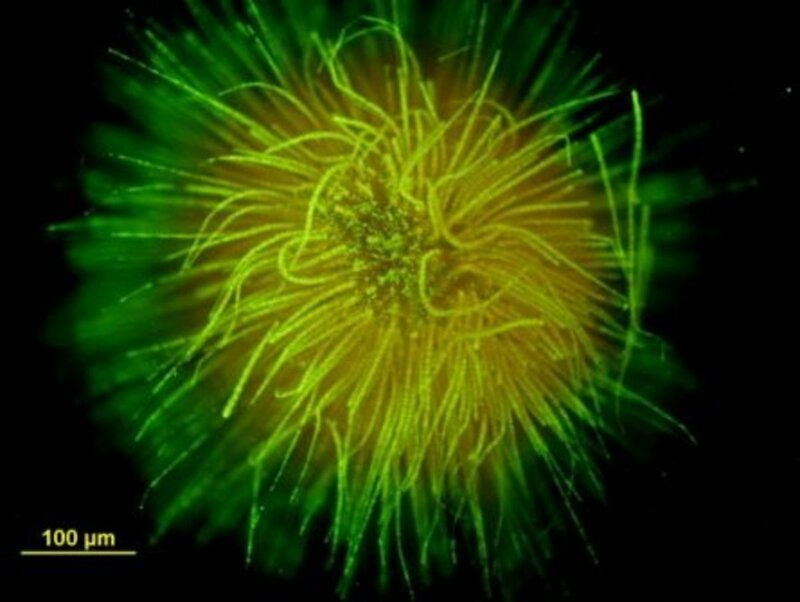 Algae uses red light to conduct photo synthesis. This scientific fact can be used to limit algae growth. Using only a little red light will slow algae growth. The less you use, the slower algae can grow. Unfortunately, restricting the amount of red light will also dull the reds in your aquarium. 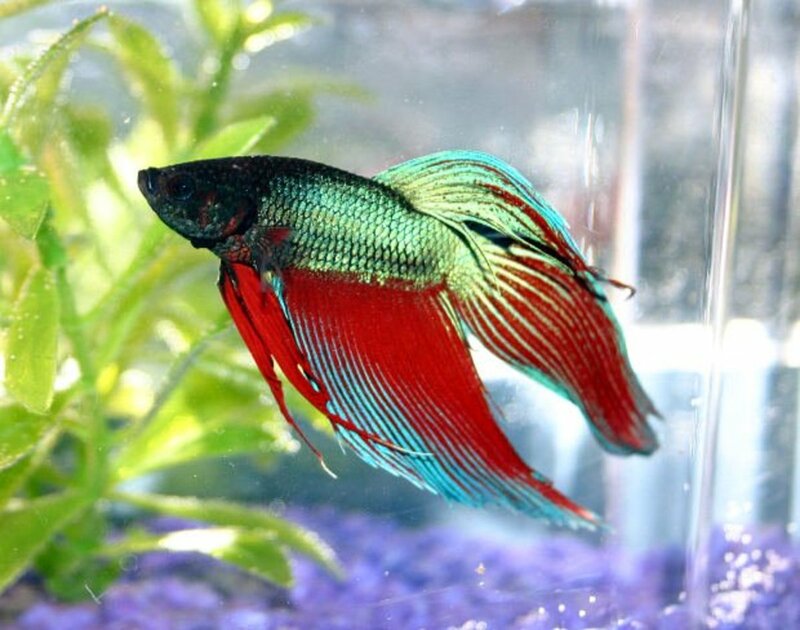 Red highlights in your aquarium, will show off all the subtle hues of green in your plants. Aquarium plants need the right amount of light. The rule of the green thumb is that the bright green plants like bright light, dark green plants like less light. Also if you see vibrant coloration on the leaves that isn't green, the plant grows best under bright light. So what is bright light? Planted aquarium hobbyist refer to bright light as heavy light. Heavy light is the gardeners equivalent of full sun. Direct sun light is about 6000 kelvin per square meter depending on atmospheric clarity. Your aquarium isn't a yard or out-door garden. The plants do not have trees, building, clouds, or many other things obstructing the light for large portions of the day. Also, you are growing aquatic plants that typically grow at depths greater then 2 feet. You only need a strong enough light to activate photo synthesis that is sustained long enough for healthy growth. This allows us to use light per gallon measurements. Heavy lighting is light levels between 4 and 5 watts of fluorescent grow light. This may be, more or less, direct sun light at the equator with clear atmospheric conditions. Medium light is any were between 2 and 4 watts per gallon of fluorescent grow light. At this light level that most aquatic plants will grow (many plants will grow faster in heavy light). Low light is enough light to see your fish. Low light is what usually came with your fish tank. Low light is light that is less then 1.5 watts per gallon of fluorescent grow light. 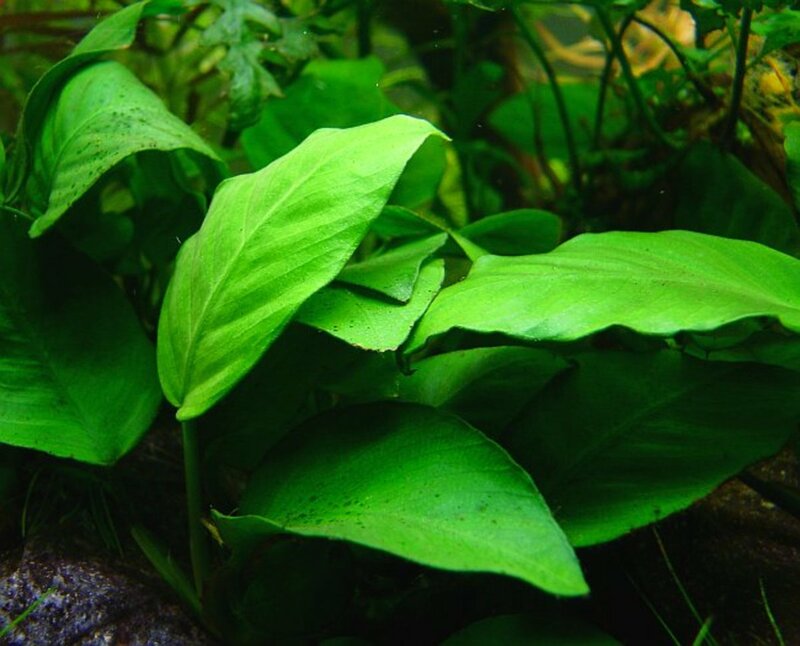 Low light is enough light to grow only the most hardy of aquatic plants. 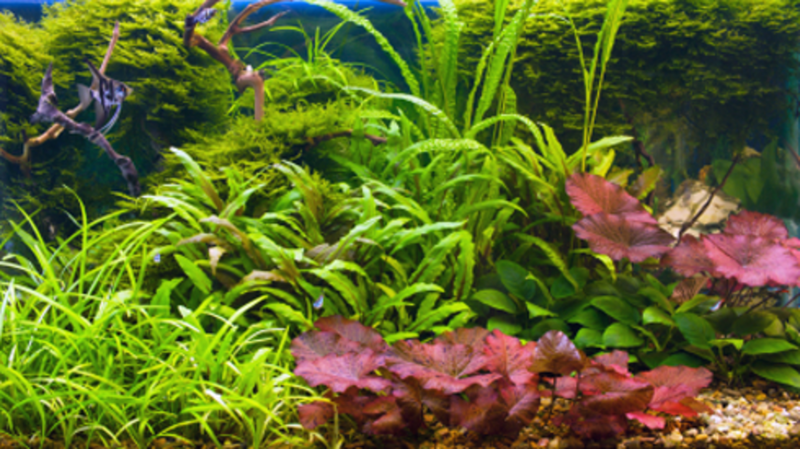 These plants include: Java Moss, Java Fern, Anubias Species, Amazon Sword, Jungle Val, Water Sprite (an exception to bright green rule), Rotala, and a few others. These low light plant species are very easy to come by and available at most fish stores. All of them will grow faster under medium light, and some will grow fastest under heavy light. Plants need night. A dark period allows plants to recharge for another day of growth. Between 8 and 14 hours of light a day is best. Plants do not need a moonlight. Using a black light on romantic evenings to display your fish tank will not hurt your plants. The black light, also known as a “moon light”, is only for aesthetics. A regular day/night cycle will help promote plant growth. Rather then depending on your memory and daily routine to keep the lights on and off at the right times, you could yous a timer. An outlet security timer is a simple solution to what will become a nuisance. These timers are available at any store with a hardware department. Strangely the light cycle of the aquarium will moderate your use of that room. You will find yourself in the room when the lights are on and out of it when the lights are off. The living room is the most common room for a planted aquarium to be displayed in. the use of a timer will help you to establish a regular sleep cycle too. Not all light bulb types are the same. The type of light fixture that is best for your aquarium depends on it's size, because you will need the correct type and number of bulbs. For most aquariums, LED fixtures are the best; but flourecents are easier on the wallet. As you increase the depth of your aquarium; you will have less space, and need more light. If your fixture came with incandescent bulbs replace them with compact fluorescent light bulbs (CFLs). You can give more light to your aquarium by placing desk lamps with more CFLs around the sides of your tank. Incandescents are a dead giveaway that you do not have more then 1 watt per gallon. Incandescent light fixtures should be replaced by tube fluorescent fixtures as soon as possible. T-5 HO fluorescent lighting is generally preferred because of their skinny bulbs, narrow footprint, availability, efficiency, low heat out put, and they don't cost much more then other fluorescent. Light systems that are marketed for coral aquariums use this type of bulb, and can be used to grow aquatic plants. T-8 fluorescent lights are also commonly available. T-12 flourecent lights are large, less efficient, and it's difficult to find antic blue bulbs for them. LED fixtures are the best for most aquariums but LED fixtures with enough light out put are expensive. LED fixtures that are commonly found in places like Wal-Mart are not even close to being powerful enough. LED lights are the most efficient. They produce almost no heat. They are available in any color you could want. Halogen lights emit a lot light for their size. Halogen light fixtures are commonly marketed as mobile shop lights. Halogens are typically used for very large, and deep aquariums. Halogen lights produce a lot of heat that can be dissipated by the increased water volume. If you plan on having a tank the size of a public swimming pool you should look into plasma lighting. Plasmas should not be used for tanks that are anything less then huge. Light fixtures are an essential part of your aquarium. They can do more then hold the light bulbs. 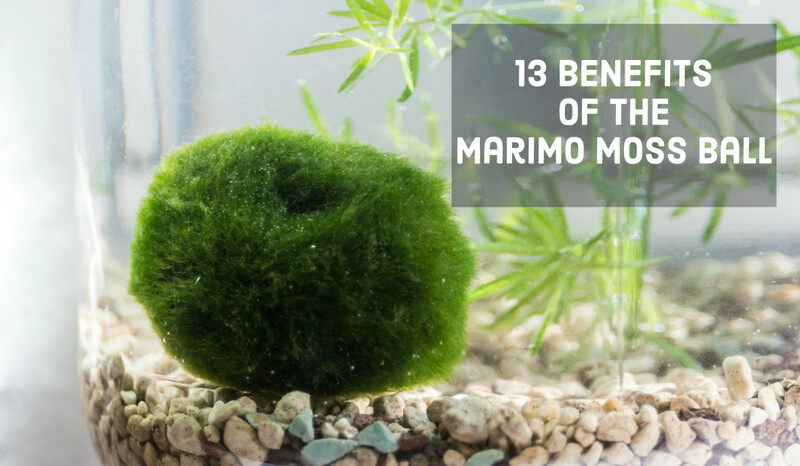 They also help to maintain water temperature, keep fish in, possibly allow plants-and-hard scape to protrude out of the water, and could hold some life support system components. Stripe fixtures just cover the bulbs to reduce glare. They will not keep fist that jump, or heat in. they are often combined with glass tops for this reason. 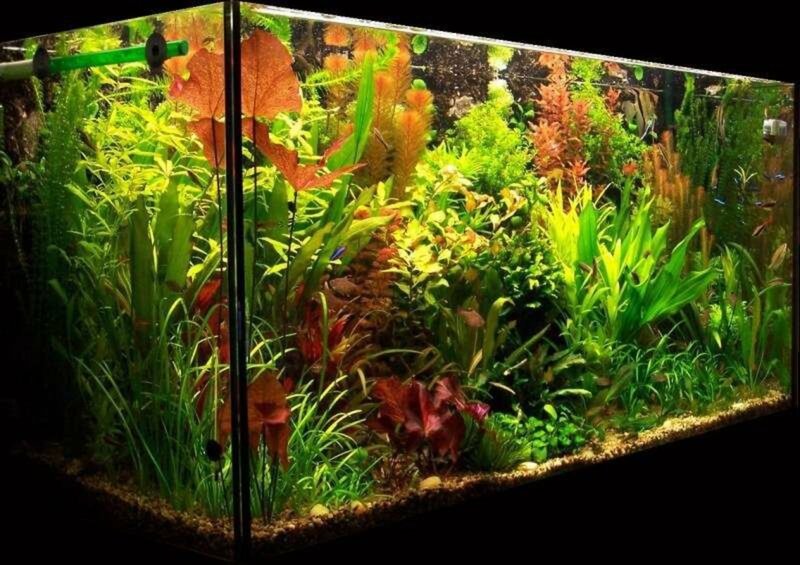 Some people choose not to use a glass top so that plants can grow out the top of the aquarium in open air. These fixtures allow a lot of glare out of the top of your aquarium. This can be remedied by creating a light barrier. This is a make shift hood. Make-shift hoods can be made out of simple materials, but my look tacky. 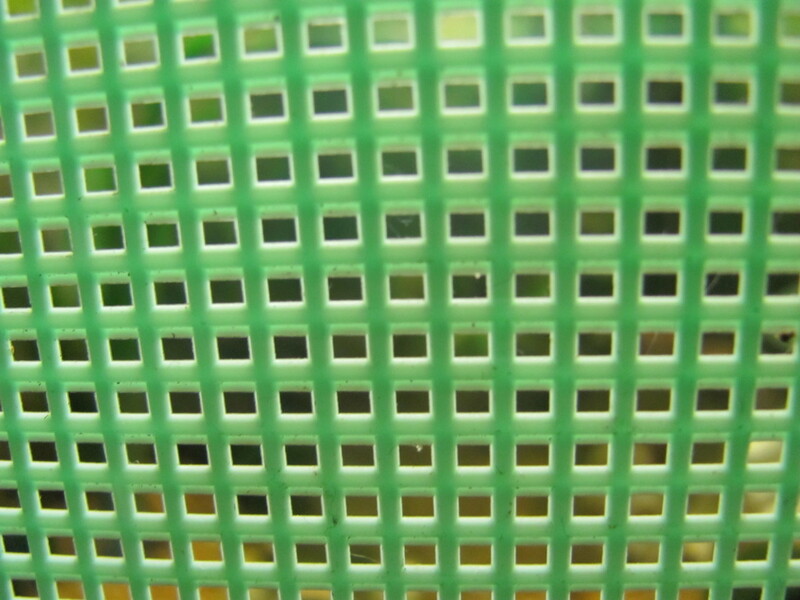 Hoods are low profile, complete aquarium top covers . They will help keep fish, and heat in. They will restrict plant growth to the water only. These prevent glare coming from coming out of the top of your aquarium. This directs more light into the water were it can be used. Because the lights are close to the water, you may experience slightly more glare from the aquarium itself. A lot of low cost hoods don't have reflectors. Reflectors focus light down, into the aquarium. With out reflectors you may experience extra glare. This can be fixed with tin foil and tape. Line the inside of the hood with tin foil. Tape the foil in place; thin strips of duct tape work great. The tin foil and tape should be completely concealed inside the hood, preventing an unsightly appearance. Canopies are high profile aquarium covers. They allow plants to grow above the water line, while keeping fish off the carpet. Canopies also dynamically reduce glare, this is why they are so common with heavy light systems. If the canopy has doors that you can't see through, glare is dramatically reduced. The lights are placed much further above the aquarium. This allows the light to be directed completely downward. Almost all the light that shines out of your aquarium, comes from being reflected off plants, fish, and décor. Canopies some times have clear doors so that you can see plats and animals living above the water line. Canopies with clear doors are very popular with people who keep Ripariums. Ripariums imitate riverbanks and shore lines (riparian areas). Glare can be reduced: lower the light out put of the canopy and then placing strip lights above the water. My aquarium (Riparium) is a constant work in progress. I run a lower tech system with a 20 inch tall canopy. I use T-5 lighting. I use 1 day light bulb and 2 atinic blue bulbs; at 3 watts per gallon. I have a lot of fast growing plants (some above the water line), and a few small fish; so algae is not much of a problem. I perform a 30% water change once every 2 weeks, with top off in-between. Nitrates stay below 3 ppm. 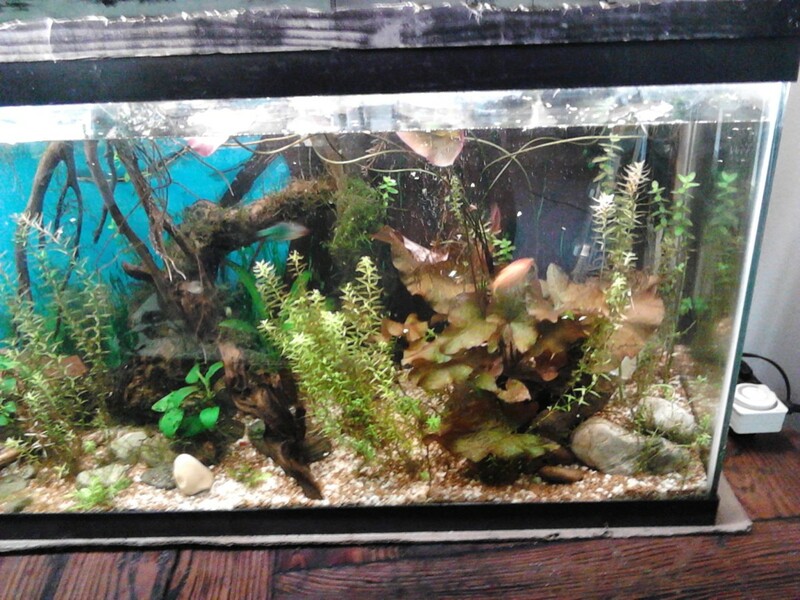 Hi i have tropical aquarium with fluval aquasky 21watts. Aquarium is running a month. I have been told to setup lights: 65%white, 25%blue,25%red and 15%green with 6h a day. In 2weeks i found out growing green algy. 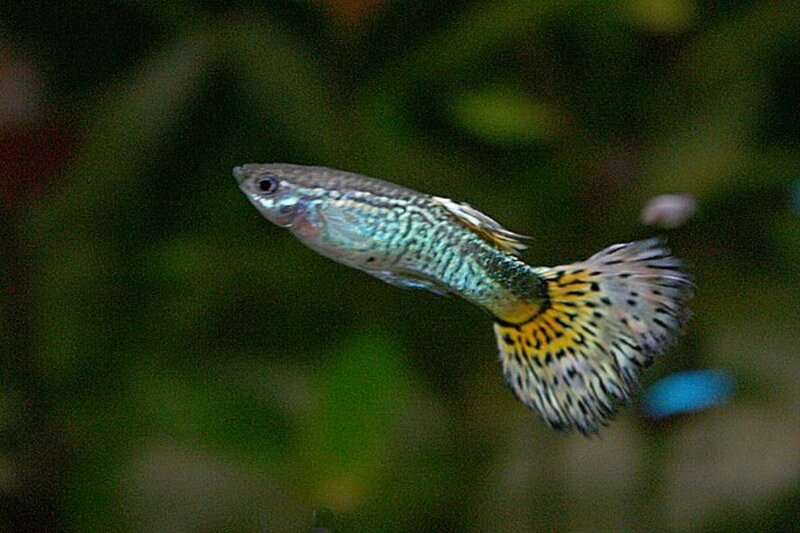 What is good for Otocinclus catfish. My NO2 and NO3 are perfect. With 17 Otos and 30 Tetras. Now i setup 80%white, 50%blue, 40%red and 10%green. Is this correct?! How to keep balance so plants will grow as they should? this is the most informative article I've found - thanks. I've researched for weeks!